The nation's still reeling from the assassination of RFK a little over two weeks ago, and television is no exception. *We're not here to debate Sirhan Sirhan's guilt, but it does bear saying that if he was guilty, then his motivation was not violence on TV, but a hatred of RFK for his support of Israel. The rest of this discussion would seem, to me at least, to be a moot point: Sirhan would have committed the deed even if the most violent thing on TV was a fluffy white kitten. *I know it's hard to believe, considering what one sees on TV nowadays, but at one time HGWT was considered one of the most violent programs on television. New York Representative John Murphy condemns the networks, saying that "[n]ight after night one program after the other shows violence in great detail and in living color." Miller, the playwright, says that the country was now at the stage where "any half-educated man in a good suit can make his fortune by concocting a television show whose brutality is photographed in sufficiently monstrous detail." *See my comments on HGWT above. One of the ways the networks have responded to this outcry of public opinion has been to pull its series' most violent episodes off the air - at least for the short term,as I mentioned a couple of weeks ago. NBC released a statement assuring the public that they "have established policies and procedures to guard against the depiction of violence fore its own sake," and CBS president Frank Stanton promised that the network "would seek to 'de-emphasize' violence" on their programs. And so the landscape changes, for a time, and kinder, gentler programming is now the fashion. But for how long? I suppose there's any number of studies that could isolate when the trend toward more violent fare resumed. No matter how noble the intent might be, ultimately ratings (and the concurrent advertising dollars) rule, and the viewers cast the deciding votes. The level of violence on television today is astounding; I can't imagine what the people, who were so aghast at 60s violence, would think of it. One could argue that, having grown up in a so-called culture of violence, people are more inured to it, and less likely to be influenced by it. And yet, things seldom change much: every time there's a school shooting or bombing or other act of violence, the cry arises once again. Lately, it's been over the violence in video games. For a long time, television has attempted to have it both ways, downplaying the influence its programs have on viewers' behavior while at the same time accepting ads designed to - influence viewers' behavior. That's always seemed a bit disingenuous to me. Of course the content of television programming affects viewers. Likewise, though, there can't be much doubt that the audience is receptive and willing. It's a chicken-and-egg situation - does the problem lie with the programming, or the people watching it? One testimony to the effect of the assassination on television is the slew of shows bearing the legend "Postponed from an earlier date," the heaviest concentration of which appear on Saturday. Although network coverage of the assassination and aftermath were nowhere near the 1963 levels, all three networks preempted virtually all of their Saturday programming for Kennedy's funeral and burial. The intent was to return to regular programming at the start of prime time, but the funeral train was four-and-a-half hours late, and the entire slate wound up being wiped out. The Prisoner, Hogan's Heroes, The Dating Game, Petticoat Junction, an ABC profile of land speed-record holder Craig Breedlove - all are victims of the accordion effect of postponements and rescheduling. The Sunday chat shows reflect the political dynamic as well: Face the Nation features a showdown between Connecticut Senator Thomas Dodd (father of Chris) and NRA president Harold Glassen over the burning issue of gun control. Presidential candidates Eugene McCarthy (Issues and Answers) and Nelson Rockefeller (Meet the Press) round out the day's guests, and I'm sure each of them touched on guns as well. Ed Sullivan: On this first in a series of reruns, CBS renames its Broadway theater in honor of Ed. Guests: New York City mayor John Lindsay, Pearl Bailey, Alan King, Met baritone Robert Merrill, actress-dancer Gwen Verdon, comedians Wayne and Schuster, the Argentine singing group Los Nimos Cantores de Murialdo, and the Emerald Society pipe bands of New York's police and fire departments. Hollywood Palace: Guest host Sid Caesar dominates this hour of comedy and music. Guests: Marlo Thomas, singers Sergio Franchi and Fran Jeffries, and the rocking Checkmates, Ltd. 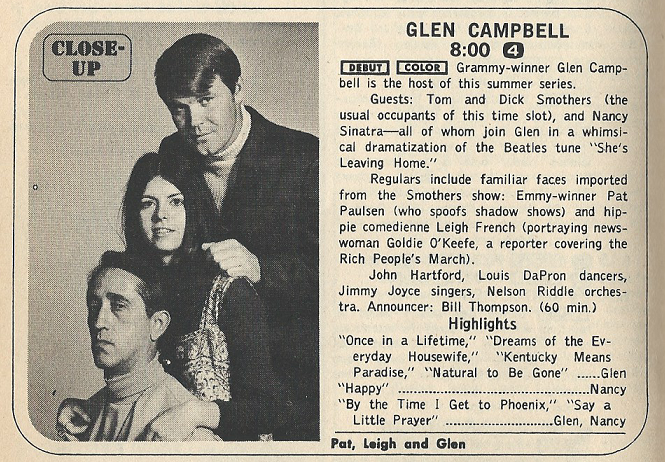 It's rerun season, and interestingly enough, this particular show of Ed's has already appeared on our TV Guide review, back in December of 1967. That time, I went with the Palace, partly because of John Lindsay's grandstanding appearance. As I mentioned, CBS could just as well have had William Paley make the presentation instead of a hack politician. This time, however, the decision goes the other way - no matter how good Sid Caesar might be, Marlo Thomas and the Checkmates are not going to edge out Pearl Bailey, Alan Kind and Robert Merrill. Verdict: Sullivan, the second time around. The summer months mean not only reruns, but summer replacement series. For those of you not familiar with that concept, back in the day many programs, particularly variety shows, took the summer off and were replaced with short-run series, also often variety shows. 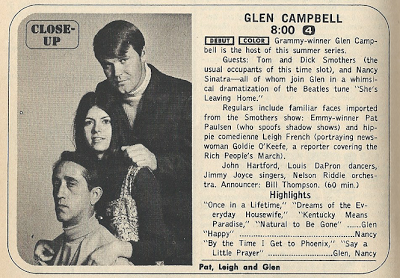 So for example, on CBS the Smothers Brothers' summer replacement is the Glen Campbell Goodtime Hour, which does well enough in the ratings to merit a return engagement the following January, where it would remain until January 1972. Red Skelton's off as well, replaced by Showtime, a variety show with a different host each week; this week, it's country singer Eddy Arnold, who also hosts NBC's Kraft Music Hall on NBC the next night. Speaking of NBC, Dean Martin never worked summers, and the fill-in was invariably called Dean Martin Presents... For the summer of '68 he presents the Golddiggers, with Frank Sinatra, Jr. and Joey Heatherton. Jerry Lewis' replacement is Showcase '68, with Lloyd Thaxton. Another trend in summer replacements for all three networks is the British import, though few of them are as radical a change as Jackie Gleason's fill-in - the mind-bending British series The Prisoner. ABC pops in another British adventure series, Man in a Suitcase, in place of its Disney-wannabee Off to See the Wizard. And Laugh-In's spot is taken by yet another spy/adventure series, The Champions. All three of them are products of Lew Grade's ITC Entertainment, a mainstay of 60s TV. Here's a personal conundrum - Friday night features the first football game of the season, the late and unlamented Coaches' All-America Game, played in Atlanta. It's actually the last game of the 1967 college season, since both teams are staffed by seniors about to join NFL training camps. * Recognizable names? Larry Csonka, who knocked 'em dead at Miami, and Ron Yary, an all-timer for Minnesota. *This game, like the much-loved College All-Star Game that pitted college stars against the defending NFL champions, was a victim of increased concerns over injuries, and pro teams' desires to get their players in camp earlier. It lasted, believe it or not, until 1976. Ordinarily I would have been glued to the tube for this game (at that age, 8, I would watch anything that featured a scoreboard), but this year was different, for opposite ABC's coverage of the game was CBS' Friday night movie, A Night to Remember. Longtime readers will recall that the story of the Titanic has been one of my lifelong passions, and so there's no question that this movie, a brilliant adaptation of Walter Lord's bestseller and the definitive Titanic movie, captured the evening in my book. But then again, this kind of scheduling is why the DVR was invented. 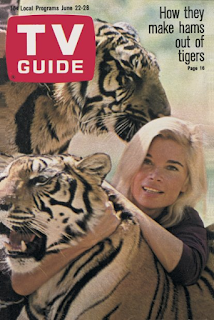 On the cover this week is Toni Helfer, who along with her husband Ralph train animals for Ivar Tors' series Daktari. But we're going to wrap up this week's review with a look at another feature from the shiny section of the magazine. It's a profile of William Shatner, who's hit it big with Star Trek, but he's still not happy. He's a classically trained actor, a veteran of Shakespearean productions and high-class TV dramas, but as he said, "A plaque on the wall doesn't by baby food." The man who wowed audiences as Henry V when he was 22 has found that success doesn't necessarily translate to happiness, nor does flying around the universe lead to professional satisfaction. He's struggling in other ways as well. His father died a year ago, he's now separated from his wife of 10 years, and he sees his life as "an empty pit." He hungers for friends, but finds only fans. He leaves us with a classic Shatner moment though, one that you can almost hear as you read it on the page. Addressing the National Conference of Christians and Jews, he tells the audience that "I'm a Jew, but I do not believe in your God...I do know we are all afraid of dying...we are all afraid of loneliness. Those are universal truths. Are you scared? I'm scared...I love you...I need you." The words of a transformed man, don't you think?